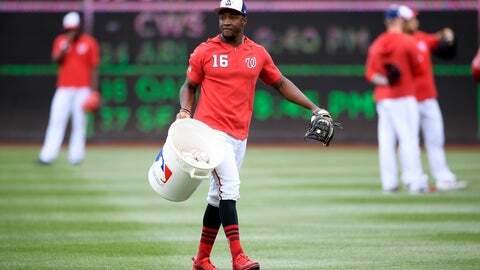 WASHINGTON (AP) — Every team has a “next big thing” in the minors, waiting for the chance to dazzle in the majors, and Washington Nationals fans have been hearing about Victor Robles for years. He’s an outfielder whose speed fuels his offense and defense. He’s shown power, too. “Toolsy” is the way new Nationals second baseman Brian Dozier described him. “Explosive,” was first baseman Ryan Zimmerman’s adjective. Robles started in center field and went 0 for 3 in Washington’s exhibition finale Monday, a 5-3 victory over the New York Yankees at Nationals Park. That’s also where he’s expected to be on opening day, finally getting his turn to begin a season in the big leagues, moving into an outfield that lost Bryce Harper to free agency. The plan is for Robles to line up with Juan Soto, the runner-up as NL Rookie of the Year in 2018, in left field, and Adam Eaton in right. He got a taste of the majors, and the Nationals got a glimpse of him, during brief call-ups in 2017 and 2018. In 83 at-bats over a combined 34 games, he hit .277 with an .843 on-base-plus-slugging percentage, producing three homers, three triples, four doubles, 14 RBIs and three steals. Soto came out of nowhere at age 19 last season. Robles is 21. Robles says Soto has helped him with advice about getting ready to be an everyday player in the majors, telling him above all to be patient at the plate. While Soto batted third ahead of Anthony Rendon against the Yankees and that appears to be the lineup Martinez will go with, Robles is often going to hit No. 9, one spot behind the pitcher. Martinez said he likes that arrangement because it allows him to have Robles followed by leadoff man Eaton and No. 2 hitter Trea Turner. That offers the youngster better protection than a pitcher would provide, in addition to having three swift guys one after the other. 3B Anthony Rendon and DH Matt Adams homered for Washington. … Yankees SS Troy Tulowitzki homered off RHP Anibal Sanchez. … Sanchez plunked 3B Miguel Andujar in the chest in the second; Andujar remained in the game until the fourth. … RHP Aaron Barrett pitched in the sixth for Washington; a series of injuries and operations, including Tommy John surgery, have kept him out of the majors since 2015. … Martinez said RHP Jeremy Hellickson will begin the season as a long man in the bullpen, because a spread-out schedule allows Washington to use a four-man rotation early. OF Mike Tauchman went 1 for 2 with a single and a walk, and played center field in his Yankees debut after arriving from Colorado in a trade. Tauchman went shopping Sunday for a razor so he could shave his beard to abide by the Yankees’ facial-hair policy. Yankees: Open Thursday at the Orioles. Nationals: Open Thursday against the visiting Mets.